To prevent strong odors when cooking cabbage, add a whole walnut to the cooking liquid. 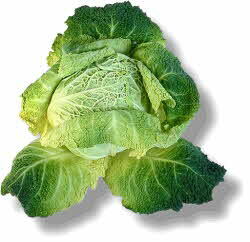 Also, never overcook cabbage - this can cause strong odors as the cabbage breaks down and releases hydrogen sulfide. One medium head = about 1½ pounds. 1 pound = 1½ quarts shredded. 1 pound raw yields about 3/4 pound cooked. When buying cabbage look for firm, hard heads that are heavy for their size. The outer leaves should be green (or red for red cabbage) and free from serious blemishes. Cabbage should be stored at 35 degrees F at very high humidity (90%+). Fresh head cabbages can be stored for several months under these conditions. Looser leafed varieties (Napa and Savoy) are more perishable and keep only 5 to 7 days. Cut up fresh cabbage, sprinkle it with lemon and enjoy it as a midday snack. Cabbage is delicious with your favorite tossed salad or pasta dish. Also, try adding cabbage to vegetable soup.